Find your comfort and style with a new iron bed. Wrought iron beds have been the top choice of many for comfort, style, and longevity. With a wrought iron bed, your bedroom immediately radiates a feeling of elegance and fashionable style to both you and your visitors. We carry a wide variety of styles from modern to classic, to contemporary and rustic so you're sure to find something that fits your style and needs. Depending on the model most iron beds are available in all standard sizes including; Twin, Full, Queen, King, and California King - Click on the product images for details. Click here for more iron bed tips and ideas. Nothing is more appealing than crawling into a quality bed after a long day. Most of our wrought iron beds are individually hand-crafted by skilled blacksmiths whose attention to detail and quality of work can be seen and felt throughout the bed from the headboard and foot board to the frame. A bed of this superior quality will remain in the home for years to come. With durability and widespread appeal, our beds are highly desired in homes and luxurious private establishments. A lower bed makes a room look larger than a higher bed. Conversely, a higher bed makes a room look more formal. Mattresses and box springs can differ from the standards frequently, so make sure to measure them before picking out your frame. Most beds are designed so that the top of the mattress will rest approximately 1 1/2 feet to 2 feet off of the floor. In order to maximize your comfort, the bed should be approximately half a foot longer than the tallest person who will use the bed. Your headboard should be about a foot taller than your mattress. Also, make sure your footboard is shorter than the headboard for aesthetic reasons. The bed is only the start of your decorating journey. Make sure to look through the rest of our catalog in order to find the accessories that will tie your room together. Want to learn more? Read The Complete Wrought Iron Bed Buyers Guide. A bed should not have to be replaced every few years due to normal daily wear. A solid frame and sturdy build is important for families that consider their furniture an asset. Wrought iron has a unique strength that stands up to the test of time and has a lower corrosion rate. This allows for hand-forging that can produce the most intricate of designs. Beds made with wrought iron can be purchased in any size at an affordable cost. Although the craftsmanship is elaborate, the actual materials to build a bed are inexpensive. Traditional wooden beds often lose their luster and some will even splinter. Place a wrought iron bed in a room and watch the decor transform into a magnificent work of art. The manufacturing of wrought iron is a tedious process that involves several phases. Although this metal is relatively pure, it still requires refining, puddling, shingling and rolling. The 1/10 of 1% of impurities is oxidized allowing the slag to be removed. This is completed by stirring the metal in a molten state. Once this is complete, small white balls of iron are placed through a squeezing machine. This binds the particles while the iron is hot. The last stage is rolling and involves placing the melted iron into grooved rollers that generate flat bars. After cooling, craftsmen can soften the iron easily with white heat to bend it into bed frames and desired patterns. Although there are many steps to building wrought iron beds, it is still inexpensive and quite appealing. Modern machinery aids in the refining process that once took painstaking hours. "Iron Beds in Modern Bedrooms"
Think iron beds are old fashioned and should be relegated to country homes? 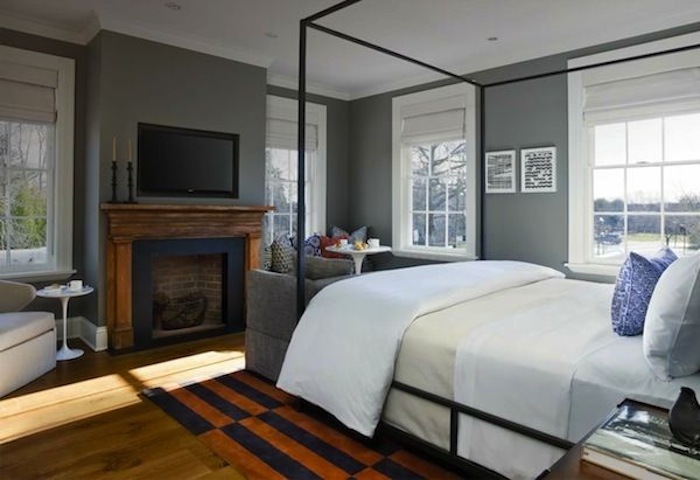 Think again, discover how cool iron beds fit into today's modern bedrooms. "Charming Iron Bed Ideas + Tips"
Let us whisk you away into the enchanting world of iron beds. We hope you'll learn to love them as much as we do.